Got a pcDuino3S running Linaro 12.07 [Linux] set up to run the No-IP dynamic DNS update client (DUC). These details should also work for a home server running Ubuntu or Lubuntu. No-IP is a provider of Domain Name (DNS) services, and they have a free tier which you can use to dynamically map a domain name host to your home server's external IP address. Got an old laptop running Lubuntu to host a Ventrilo server. This will also work for Ubuntu. 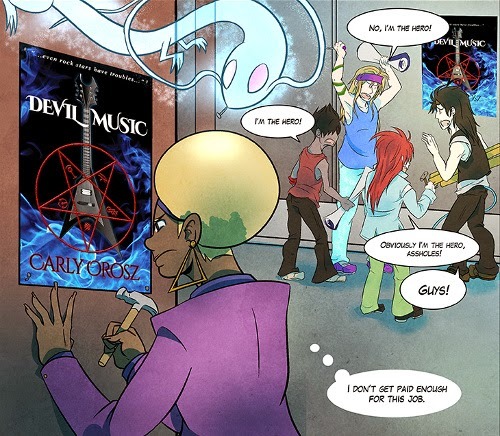 This is the story of how we got a web comic artist for the Devil Music comic, by Carly Orosz to accompany her novel by the same title. tl;dr: Carly selected Candace Ellis, whom we found on deviantART, and the comic is still going! In order to increase awareness and sales ("conversions" of site traffic to customers) of the book "Devil Music" by Carly Orosz, the promotional landing page is now displayed to new visitors instead of the homepage.